I am highly impressed by Danny. It's evident that he's done a lot of games, and done them well. His pace, inflection, command of the action and the audience are all there. He has the polish of a seasoned veteran. Danny has a very crisp and professional approach. His energy is excellent, his delivery is well-paced and he has a great passion for this business. Danny is well on his way to a highly successful career. There aren't many guys his age that possess his talent. Danny is a tireless worker, and his broadcasts certainly show that. He uses colorful and descriptive language that pulls you in and is a pleasure to listen to. 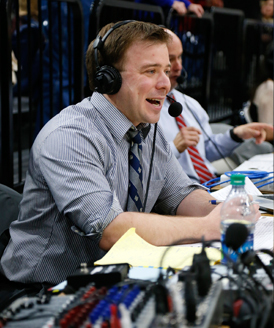 Danny is a true professional, one whose voice is clear and unmistakable and makes the casual listener even more intent to follow the action. I could not hold him in higher regard.